Khan writes of shadows. Thinking with the particularity of the experiential and spatial dimensions of the ruins of Firoz Shah Kotla, she suggests shadows (as opposed to light/enlightenment) as a conceptual and phenomenological vantage point for the anthropology of Islam. Much of Firoz Shah Kotla is now a space of subterranean darkness and smoke, and Khan discerns three overlapping sets, “a latticework of shadows,” in the dark of these ruins: the shadow of Islamic sovereignty, the shadows of the jinns who are reputed to inhabit these ruins, and the shadows of the human selves who come to this shrine of many jinn-saints for healing. The idea of sultan as the “shadow of God on Earth”—a concept prevalent in pre-modern Muslim polities—contains within it the metaphor, as Khan shows us, of the government as a place of shelter to be compared with the shelter of shade in the desert. Shadow here is not “shadowy,” as in unclear or threatening, but a space of cool in the heat, of refuge, of mercy: concepts and affects central to the Islamic tradition and to continuing subaltern imaginations of sovereignty. Is the decree-issuer of the realm of Hindustan. Thinking with Khan about the latticework of sovereignty, shadow, and refuge led me to the above sh‘er by Ghalib, a couplet that delights in the multiple meanings it generates through seeming paradox. The perspective from the shadows allows us both to think of paradox as centrally constitutive of the discursive tradition of Islam (as the late Shahab Ahmed does), and also allows us to think about tradition paradoxically. It allows us to think, for instance, of affective inheritances in the constitution, transmission, and transformations of the Islamic tradition. In thinking of the shadows of the self at Firoz Shah Kotla, Khan writes, “I would go so far as to name this self the unconscious and to say that the ruins draw visitors by making itself the inner rendered as the outer. Thus traversing the ruins is a traversal of one’s inner self, otherwise hidden to oneself.” Khan’s image of the self traversing itself among these ruins—and thousands do traverse these ruins each week—is an opening out of the Naqshbandi Sufi principle of “safar dar watan,” the inward journey of observing the self dispassionately. This is a beautiful and compelling image, not just because it inverts the assumed interiority of the self but because it also gives us an insight into how the encounters and intimacies of traversing and inhabiting Firoz Shah Kotla with human and non-human others—the exteriorized domain of the unconscious—can have such power to affect psychic and ethical transformations. Spadola writes of rivers. Or rather, in a wondrous image, he writes of Islam as a river that overflows its banks. This image is a response to the distinction I make in the book between Islam as identity and Islam as inheritance. Spadola writes, “Islam as inheritance is broader and less narrowly channeled. It is not merely Islam as a river, in which one might take a dip and leave refreshed; it is Islam that floods the banks and deposits nutrients in the silt left behind in the north Indian landscape.” This Nilotic (and Gangetic!) image of a river breaking its bounds to make the landscape through which it passes more fertile is a profound parallel to how Islam in India has enriched north Indian life and its conceptual, ethical, and affective potentials across the usual boundaries of religious identity. This image illuminates how it is not Islam that is Indic, as many have argued, but rather how the Indic itself, at least if we can so characterize north Indian popular culture and ethical life, is deeply Islamic. Silt is elsewhere deposited deeply and indistinguishably into the heart—the soil—of here. The ground for ethical cultivation in north India, we could say, is both replenished and transformed by Islam. Spadola’s image is a conceptual challenge to the nationalist amnesia that is such a dominant force in Indian politics today, an amnesia that wishes to forget and make foreign the deep presence of Islam and Muslims in India. Spadola notes that while I accept key insights of Talal Asad’s approach to the discursive tradition of Islam, my work also “points toward dissatisfaction with its heretofore accepted limits,” and hence attempts to “reimagine the very definition and coherence of ‘discourse.’” As an ethnographer, I am deeply committed to the epistemological unsettlings that fieldwork led me through, and how these in turn challenge established academic certitudes. What do we make of the discursive tradition of Islam when its authorized transmitters and interpreters in post-Partition Delhi are jinn? If animals can be recognized as saints in a landscape of enormous ecological devastation, how does this challenge and/or rework inherited ideas of walayah or sainthood? 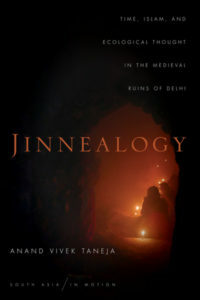 The ethnographic and historical detail of the book is deeply archaeological in the Foucauldian sense: full of ruptures, disagreements, and reworkings ranging across an array of texts and conversations from contemporary Delhi to colonial records to hadith to eighteenth-century rekhti poetry. However, I am also committed to the question of coherence—of finding a grammar, as it were, of debate and disagreement, through which Muslims articulate and embody their divergent practices of being Muslim. This intellectual commitment to both contingency and coherence is very different, I believe, than Khan’s reading of my work as presuming “that Islam constitutes a stable and unified object of study.” On her reading, my work also presumes that Islam “needs saving, whether from nationalist amnesia or from itself (as in Taneja’s insistence that what he witnesses is necessarily progressive, anti-hierarchical, and non-patriarchal).” Was I trying to “save Islam from itself?” I had thought of myself as undertaking a very different exercise: I paid deep ethnographic attention to a place identified by those who came here as a Muslim saint-shrine. Much of what I witnessed in this place was anti-patriarchal, anti-hierarchical, and anti-identitarian, especially in contrast to the life of the surrounding city. For those who came here, both Muslim and non-Muslim, it was also very Islamic. To do justice to their worldview and ethical lives required me to challenge and expand established ideas of what constitutes (and who participates) in the discursive tradition of Islam. This is an academic conversation that the book respectfully, if in a somewhat contrarian fashion, engages. Spadola reads my work as being informed by an “urgency to make room for realms of Islamic tradition that need not be legible to be lived.” Indeed, much of what is seen at Firoz Shah Kotla is illegible from modern standpoints. In several chapters of the book, particularly the one on translation, I pay attention to how older forms of knowing and being coexist and are constantly in conversation and contestation with more modern forms. This contestation constantly unsettles easy epistemological certainties, an unsettling which I have tried to emulate in the book. The Urdu and Persian poetry used as epigraphs incite an affective response that enhances the readers’ engagement. Perhaps these epigraphs add to the book’s elegiac quality that Khan is taken by. But the greater challenge, I would like to propose, is to make ourselves literate, as it were, able to read what is currently illegible to us. Urdu poetry, like poetry in Persian and Arabic and other languages that Muslims speak and write, can be at once deeply philosophical and deeply moving. The inducement of hairat, or wonder, as a philosophical, ethical, and affective response to the world is part of the work that poetry does. The bringing together of thought and affect has much to teach, I believe, not only to scholars of Islam, but to the wider world of humanities and social sciences. How do we think not just about affect but with and through affect? How might mourning and joy and hairat contribute to forms of thinking about the world and our political and ethical responses to it? Khan sees an appropriateness, for instance, in which the tone of mourning allows us to fully engage with the bureaucratic destruction that has marred the Islamic landscapes of Delhi. Spadola similarly pushes us to think with the figural, to what inhabits and moves discourse but cannot be reduced to it.